Nigeria were the first African side to confirm their place in Russia 2018 – their sixth World Cup in seven tournaments since making their debut in the United States in 1994. Having beaten Swaziland in the second round of the CAF qualifiers, the Super Eagles stormed through the final group stage despite facing a nightmare draw against current African champions Cameroon, Algeria and Zambia. Such was Nigeria’s dominance of the group, that they had already confirmed their place at the finals by the time they fielded an ineligible player in their final qualifier in Algeria. They will be hoping for less drama in Russia, although they’ve landed another tough draw: Argentina, Croatia and Iceland. Having already won in Zambia and at home to Algeria, Nigeria saw this third group game as an opportunity to stamp their authority on CAF Group B – and they did just that with a 4-0 drubbing of recently crowned Africa Cup of Nations winners Cameroon. John Obi Mikel (above) was at the heart of most of the hosts’ attacking play, and it was his clever assist that played in Odion Ighalo for the opener after half an hour. The Nigerian captain scored the second himself before half-time, stabbing home an admittedly poor corner from Victor Moses. With Cameroon chasing the game in the second half, Nigeria were able to play on the counter-attack. Moses buried a low shot from the edge of the box early in the half, with Kelechi Iheanacho heading the fourth late on. The Super Eagles had one collective foot on the plane to Russia. The story from Nigeria’s final qualifier – effectively a dead rubber with their finals spot already confirmed – was written more off the field than on it. An initial 1-1 draw in Algeria, Yacine Brahimi’s late penalty securing a draw for the hosts, was turned into a 3-0 defeat after it transpired that Nigerian full-back Abdullahi Shehu should have been suspended from the game after picking up a yellow in the 1-0 victory over Zambia (below) that had assured their qualification. 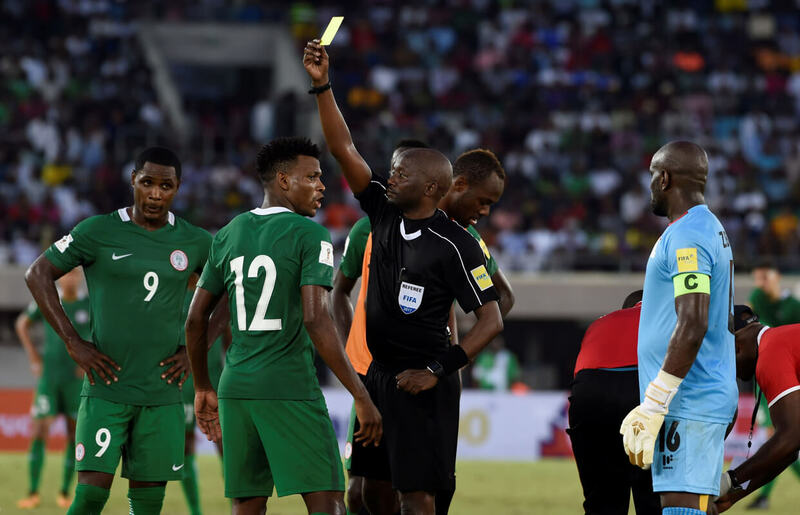 The Super Eagles were more than happy to accept the amended result and accompanying fine, safe in the knowledge that it would not put their World Cup status in jeopardy. But the mistake did shine a light on the potential for organisational difficulties in a team whose tournament history is not without its controversies. They will be hoping for a smoother passage in Russia, where there are hopes that they can reach the last eight at a finals for the first time. Leicester midfielder Ndidi is a versatile, defensively minded player whose main strength lies in protecting the units and teammates behind him. 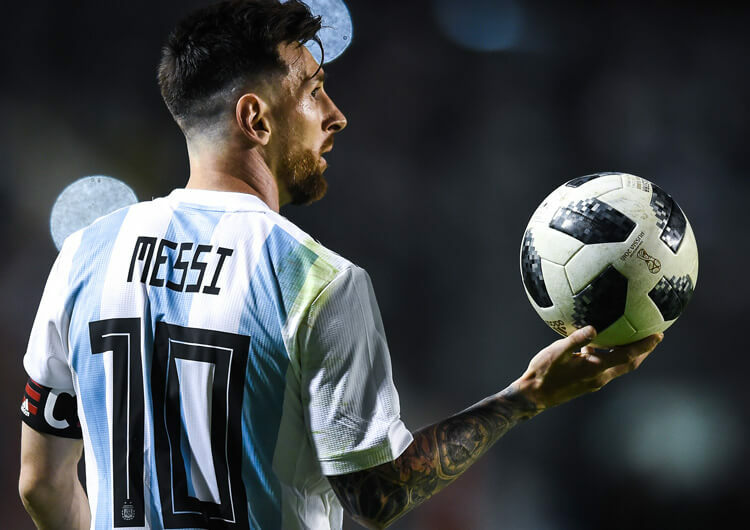 He is more than capable in possession, but is known more as a destroyer who relies on more creative players to move the ball forward after the regain. Ndidi (below, left) began his career with Belgian side Genk, but after two impressive seasons was touted as the ideal replacement for the departed N’Golo Kanté at shock Premier League champions Leicester. He soon established himself in the first team, despite the Foxes struggling for much of their title defence, and has further enhanced his reputation during his first full season at the club. 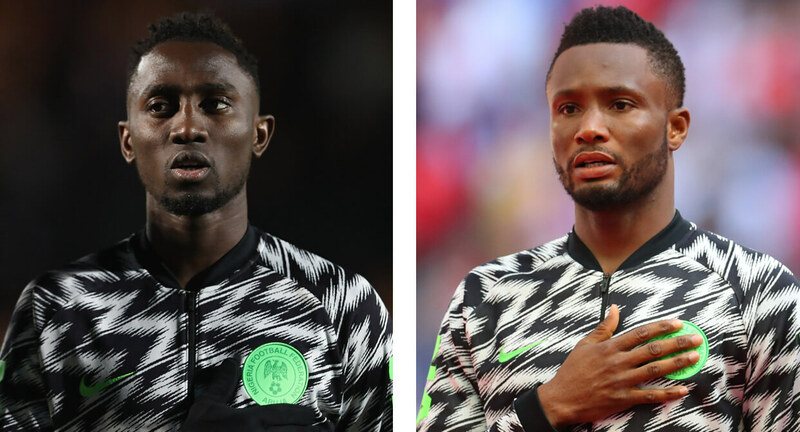 Still only 21, Ndidi will be used mostly to provide the defensive cover that captain John Obi Mikel will need behind him in order to control and influence the game. He is also versatile enough to drop into the defensive back line in the event of injuries or suspensions. The current captain of the Super Eagles, midfielder Mikel came to prominence in England as a teenage prospect involved in a bizarre transfer saga involving Manchester United and Chelsea. He eventually moved from Norwegian club Lyn to the latter, where in over a decade he made more than 300 appearances in a mostly deep-lying and defensive midfield role. At Chelsea, Mikel (above, right) won two Premier Leagues, three FA Cups, a League Cup and a Europa League, not to mention an unlikely Champions League final triumph in 2012. Mikel played the entire match, providing superb defensive cover as a Bayern Munich onslaught was contained. He moved to China after Chelsea chose not to extend his contract at the end of the 2016/17 season. Despite his defensive qualities, for Nigeria Mikel is utilised in a more advanced role, often linking midfield with attack. With his quality on the ball, he is more than capable of controlling games for Nigeria – but they will miss his defensive attributes, especially in games when they may have to defend for prolonged periods. After an extremely turbulent childhood during which both his parents were murdered, Moses moved to England and worked his way through the Crystal Palace youth academy. After breaking into the first team at Palace, a move to Wigan Athletic followed – and, two years later, another one to Chelsea. Initially sent out on loan to a number of Premier League clubs (Liverpool, Stoke, West Ham), he was transformed by the arrival of Antonio Conte into a dangerous, attack-minded wing-back. Despite representing England at nearly every youth age group, Moses chose the nation of his birth at full international level. Used in a much more attacking role for country than club, he is arguably Nigeria’s most talented and effective player in the final third. Even if and when head coach Gernot Rohr shifts his formation into a 3-5-2, expect to see Moses remain part of the front line. With a combination of pace and power, he is the ideal support striker for regular lone striker Odion Ighalo. While the pair’s relationship as a front two is still in its infancy, it has certainly shown signs of development in recent friendlies. The German Gernot Rohr (above) started his professional playing career with Bayern Munich in the early 1970s – but his stay at the Bundesliga giants lasted only two seasons, and he subsequently spent more than a decade with Bordeaux in France. He cut his coaching teeth at the same club, taking them to the UEFA Cup final in 1996, before taking the helm at a string of mostly French clubs from 1999. In 2010, he moved into international management as the head coach of Gabon. Additional spells with Niger and Burkino Faso followed, before he stepped into the hottest of African hotseats in 2016: Nigeria. As one of the most experienced coaches in Africa, Rohr has progressively improved this Nigeria team and squad, focusing on building a team spirit that has translated well into a solid defensive tactical approach. Nigeria flourished as supposed underdogs in a qualifying group featuring Cameroon and Algeria, and will inevitably adopt a similar approach to a tricky group in Russia. Expect Rohr to set his team up to be solid and resolute in defence before looking to strike with potent counter-attacks from deep. As Nigeria have been drawn with both Argentina and Croatia, it is likely they will spend prolonged periods without the ball and will thus have to prioritise protecting central areas – and Wilfred Ndidi and Ogenyi Onazi (above, right) look to be the ideal candidates to fill these defensive midfield roles. Individually and as a pairing, they will provide the perfect defensive anchor, particularly when Nigeria are looking to counter-attack from deep. 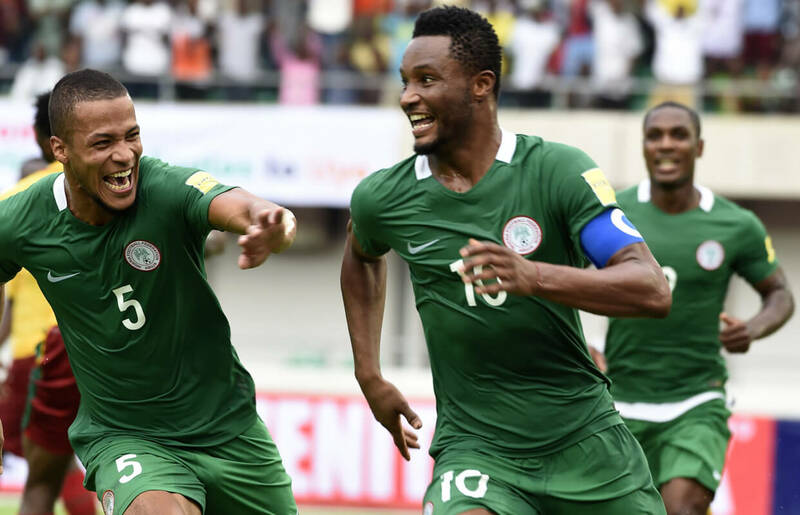 The role of captain Jon Obi Mikel will cause much debate, however, as Nigeria often look to funnel their attacks through him – but the two men sitting behind him lack his ability in possession and will need his assistance after the regain is completed. A common criticism of Nigeria’s transition into attack is a lack of fluidity, as neither defensive midfielder can provide consistent calmness on the ball. If they can’t get Mikel on the ball sooner, they may have to look for more penetrative forward passes for their front men to run on to rather than a short game into attackers’ feet. One potential solution to Nigeria’s lack of central composure is to build and attack with a focus on the wide areas. Nigeria possess great pace in attack, with Victor Moses, Alex Iwobi and Ahmed Musa all able to run in behind at speed. If Mikel is deployed much closer to the defensive anchor, and thus deeper in possession, Nigeria may have to utilise the speed of the front line with more direct transitions into attack. Odion Ighalo is likely to be deployed as a lone striker, and his movements will be key to releasing the wide players into attack. Ighalo (above, right) has the ability to create space for himself, but he may have to relinquish his goalscoring instinct in order to create space for teammates to attack. By dragging his defensive marker away from either wide player, he can create one-on-ones for Iwobi or Moses, for example, to exploit (above, left). In addition to Ighalo, Musa and Kelechi Iheanacho are alternative options at centre forward for the Super Eagles. Nigeria’s preferred formation under Gernot Rohr has been a 4-2-3-1, but he will surely have worked in different shapes and systems should they be required. He has certainly flirted with a 3-5-2 structure, making use of the defensive stability in central midfield, while adding an additional attacker to accompany his usually lone striker. In a 4-2 victory over group rivals Argentina in Russia in November, and an impressive second half against England at Wembley ahead of the World Cup, Nigeria have shown that they do have tricks up their sleeve. This system would still enable them to deploy two defensive midfielders, thus maintaining the defensive security they prioritise – but with Mikel deeper, their captain could gain more control over the rhythm and tempo of the match. This shape also creates a central attacking partnership around Ighalo. 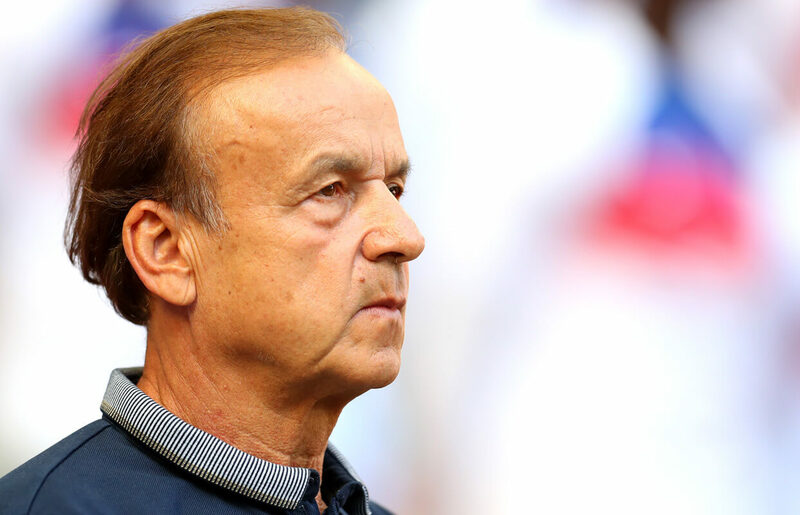 Rohr could make use of the additional striker options he has, by possibly combining the movement of Ighalo with the speed of Musa, or the finishing capabilities of Iheanacho. It is likely, however, that Moses (above, right) would be moved higher into a supporting striker role, with his quality on the ball in the final third arguably the best in the squad. This formation would also allow Alex Iwobi more freedom to create from a central starting point – away from the wide areas he is limited to in the current shape.